Look what I found during my Bangkok trip? 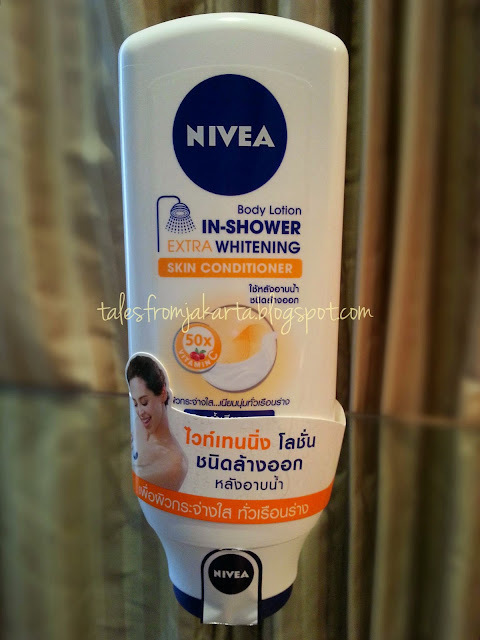 The new Nivea In-Shower Skin Conditioner with extra whitening power! No SPF though! The unforgiving hot sun has moulded me into a skin-whitening beauty junkie. Anything that has extra whitening power and SPF in it attracts me like magnets. 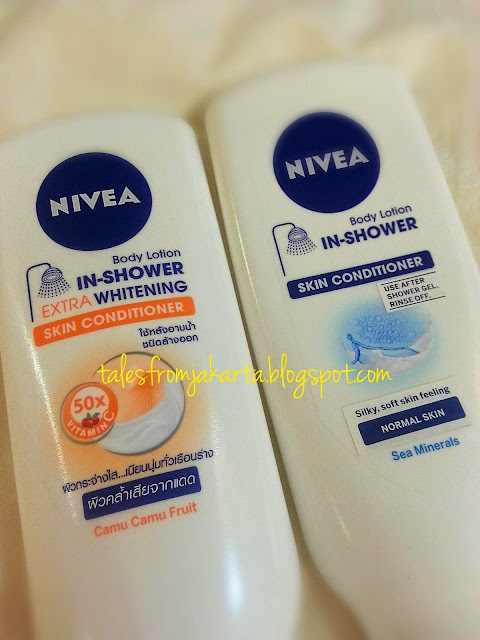 Earlier this year, I wrote a review on Nivea skin conditioner and I wished it has the whitening with SPF variation. When I spotted it in Boots, Bangkok, I quickly grabbed a few bottles without hesitance. Selling for 1050 THB each, it's way cheaper than the ones sold in Singapore. However, after trying it out, I was actually quite disappointed. The unpleasant slippery feeling and stickiness after towel-drying remain similar to the variation for normal-skin that I've purchased earlier this year. The scent is indifferent as well, except that this one has Camu Camu for skin whitening effects and the one for normal-skin contains Sea Minerals. Since whitening power need consistent usage to see result, I cannot write how effective the product is, for now. My skin is definitely smoother, but not softer. Like hair conditioners, it sort of 'coat' the skin with a layer of moisture for long lasting smoothness. Although it should have come with SPF for extra points, I am just as happy to have it for I-am-too-lazy-for-lotion days.